Horizontal wind turbines "made in Germany"
By the wind turbine, an energy producer was invented, which does not require a lot of infrastructure and which can be installed especially in town. Everywhere in places, where wind currents or drafts are occurring, for example over roofs or between blocks of houses, bridges or viaducts, thus in places where there are wind speeds, where these turbines can be used. The night wind is even more effective than the wind of the day, this is proven scientifically. At the highest point of the solar parks, wind turbines are connected at the end of the rows of photo-voltaic cells with the existing mounting rails. In such a way, that the photo-voltaic surface is used as surface of wind currents and the surfaces‘ yield of the photo-voltaic cells can thereby produce a higher yield of energy. In case of reduction of global radiation per m², the performance values in kilowatt of the solar installations decrease, and our wind turbines capture these losses and widen the yield. The generators Coreless - this new generation of permanent-magnet generator-of-wind, are developed for the area of low winds or currents. The generator without core - no moment of pause - is effective by its low performance start/boot 0.02 and 0.03 N/m. This system is very powerful and works with a steady stream of energy. Another feature of these generators. Coreless is an higher performance that starts earlier in comparison with conventional generators. Conventional generators cannot work in this area. As an example we take here the PM Synchronous Generator. With the stator core it has its limits in the starting phase, due to the braking function of the moments of pause, which comes from the magnetic attraction force which is formed between the stator and the rotor. 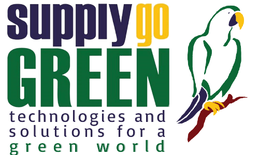 SUPPLYgoGREEN technologies for a green world is developing new markets for LWS System. If you do not have any representative in your country, please talk to us. It will be pleased to inform you about this technology and how you can get it!